Many people like Tunde Folawiyo for example, enjoy listening to indigenous African music. Music has always played a hugely important role in African countries, so much so that a number of cultures do not even have a separate word for music, as it has become so deeply ingrained into their daily existence. Because many of the languages spoke on the continent are tonal, this has led to a fascinatingly close link between the spoken word and music, with many indigenous African instruments structured in such a way that they can mimic the sound of the human voice. This effect is what drum languages are based on. Indigenous African music is typically performed by a group of people, rather than just one individual. From a structural point of view, it can be characterised by its polymetric and polyrhythmic features, with one melodic phrase being countered with a contrasting phrase, which creates a ‘call and answer’ pattern. In terms of its influences, there is no single factor which has impacted African tribal music; rather is it the culmination of a multitude of things, including population movements, politics, the physical environment, language, and historical experiences. Whilst millions of people, including Tunde Folawiyo enjoy listening to this particular type of music, few are aware of its history. The origins of indigenous African music have been determined using visual sources, such as rock drawings, book illustrations and paintings, as well as archaeological objects, written accounts from travellers, and sound recordings. Because the first musical instruments made here are believed to have been created using vegetable matter, they have decomposed over the course of the years. However, drawings of instruments on stone walls in Yorubaland indicate that some African tribes began making drums during the 10th century. 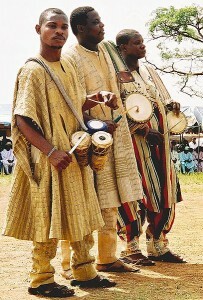 The igbin drums, which are cylindrical in shape and held between the knees, were the most commonly-used instrument at this point in time. A pressure drum call a dundun, is thought to have been introduced five centuries later. Tubular and pellet bells were also popular during this era. One famous set of rock paintings which provided musicologists and historians with a great deal of insight into this type of music can be found in Algeria’s Tassili-n-Aijer plateau. Discovered by Henri Lhote, a French ethnologist, in 1956, these images date back to 6000BC, and depict lively dance scenes, as well as musical instruments reminiscent of those used by Neolithic hunters. Considered to be one of the oldest examples of musical performance in all of Africa, this remains one of the most significant discoveries of the 20th century.